You can’t keep a good man down. And in this case the good man is popular Victorian Cameron Percy and the ‘down’ is the Web.com secondary US Tour. That’s because Percy has sensationally booked his return to the main PGA Tour in 2015 after landing one of 25 tour cards up for grabs after the regular Web.com Tour season ended last week. 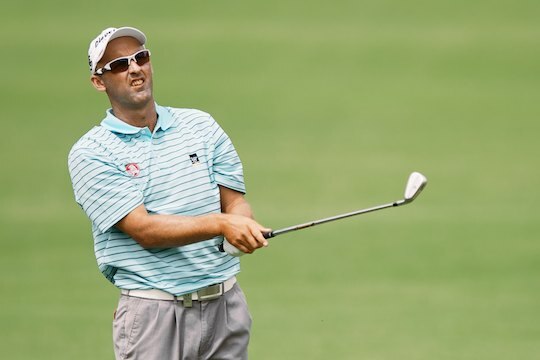 Percy, who played on the main tour in 2011 and 2013, scrapped his way to 14th place on their money list after a recent event in Oregon, the Portland Open. But it was his charging finish to grab the lion’s share of the cash and the title in the recent Price Cutter Charity Championship in Missouri that secured the 40-year-old passage back to the major tour. Unfortunately Percy was the only one of several Aussie hopes to finish in the top 25 although eight others finished between 26th and 75th. That guaranteed them a place in the four-week finals series where 25 more cards will be awarded. Each finals event has US$1 million prizemoney. James Nitties, Rod Pampling, Steve Allan, Ashley Hall, Alistair Presnell, Aron Price, Mat Goggin and Adam Crawford also qualified for the finals series. Former Australian Open champion Greg Chalmers, Bronson La’Cassie and Scott Gardiner also earned places in the finals via the PGA Tour, finishing outside the top 125 on the money list but inside the top 200 to get a second chance to return to the big Tour in 2015. Percy joins 10 other fully exempt Australians on the US PGA tour for 2014-15 including Adam Scott, Jason Day, John Senden, Marc Leishman, Stuart Appleby, Steven Bowditch, Matt Jones, Aaron Baddeley, Robert Allenby and Geoff Ogilvy.